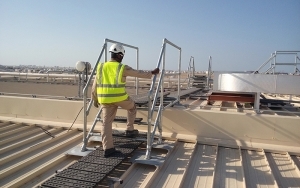 Kee Safety’s Bespoke Access Platforms allow safe access to areas where off the shelf fabricated platforms or other systems such as ladders or towers are not appropriate. Bespoke Access Platforms are suitable for difficult to reach areas such as access to machinery, warehouse racking, maintenance of vehicles or trains, welding or plastering; our platforms can be designed to suit virtually any requirement. 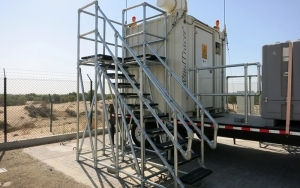 Kee Safety's platforms are custom built and can be designed up to 3m in height. When higher access is required, the platform is constructed with the addition of an extra support arm. Our Bespoke Access Platforms are modular in design and utilise either KEE LITE aluminium or KEE KLAMP cast iron fittings to provide an extremely secure, robust, corrosion resistant access platform. Using off the shelf fittings also allows the platforms to be delivered and constructed quickly and easily, with minimal disruption on-site. Each platform is designed to suit a specific application and is designed in accordance with the relevant criterial from EN 1004:2004 or BS 1139-6:2005 or PAS 250. A CAD drawing is supplied with each quotation to allow customers to visualise our proposal. All Kee Safety’s platforms are delivered with drawings to clearly show how to construct the platform. Small platforms can be delivered fully assembled but will need checking before use. Larger platforms are delivered as loose parts and will be assembled on site by Kee Safety’s installers. 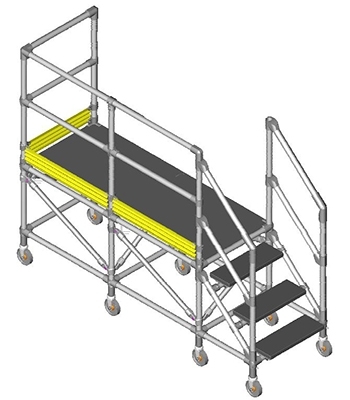 Kee Safety's Bespoke Acess Platforms are made from modular components easily modified or adapted. Our platforms are available in aluminium or steel. Our slip-on fittings securely join structural steel or aluminium tube into almost any conceivable configuration across a variety of angles and are also capable of accommodating on-site variations. Designed with ease of installation in mind, the components completely eliminate the need for welding or fabrication. KEE LITE and KEE KLAMP fittings can be installed using a standard hex key, with each fitting incorporating an internal set screw to lock the respective fitting safely and securely onto the tube to create a strong, stable and safe guardrail structure. 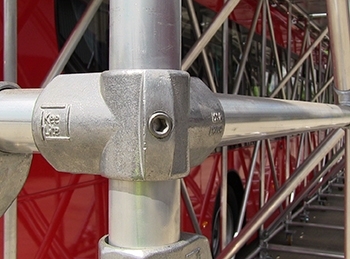 Fittings in size 8 are usually used in construction of high platforms; fittings in size 7 are used in construction of small and medium size platforms. KEE WALK Treads provide a safe, anti-slip, level walking surface for anyone who needs to access the platform. They can be used for both stair treads and flooring. Kee Safety’s bespoke access platforms are designed to suit specific customers’ requirements, they are constructed without welding which means repairs or modifications can be made on site without specialist equipment. Below are a few examples of our bespoke work platforms but please CONTACT US to discuss your requirements and we will design exactly what you need. The Medium Mobile Work Platform is 1m wide. The Solo Mobile Work Platform can be used in many different situations. It can be very convenient during short maintenance tasks which are carried by one person. The platform can be easily moved by one person only. This work platform has been designed especially for train undercarriage repair work; maximum 5 people can use it at the same time.